TimInOhio wrote: Do I connect all the grounds to the -12VDC or just to pin 5 of the serial port? All the grounds, pin 5, and the "negative" side of you power supply are hooked together. Look at the circuit diagram and imagine you have a wire from the negative side of your power supply running to the ground on C1 then to the ground on Q1, then to the ground on R1 and ending at pin5. For diagram clarity, and convention, that wire is not shown in the circuit diagram. Ok, that is the info I am looking for. I can picture a simple circuit with a battery with a + and - running a light bulb - but was over thinking it in my head, with the negative polarity shown on the power supply. Thanks for all the help! I'm not an Electrical Engineer, but I don't think that you want to connect the ground of the power side of the solenoid to the serial port ground (pin 5), just the trigger part of that circuit (the one shown coming off of R1). Try to keep your computer's serial port protected as much as possible from the solenoid circuit as you can. TimInOhio wrote: I have a wall wart labeled output: 12VDC 500mA, with negative polarity on the tip and positive polarity on the outer shield. Interesting - I just checked a few wall packs around the office and they are all center positive. Well, if yours is outer positive, wire accordingly. Is there any harm in having +12VDC on the outer shield, which is common to the metal flange of the power jack - i.e. is there any chance someone could be hurt by coming in contact with that flange that has +12VDC on it? *5 J's* wrote: Interesting - I just checked a few wall packs around the office and they are all center positive. Well, if yours is outer positive, wire accordingly. On second thought, I guess that's no more harmful than touching the positive terminal of your car battery, right? Hmm - never tried it with out having a ground on pin 5. I assumed the open start gate trigger at pin 4 needed this ground. I need to build another start gate for a new track soon - guess I'll try leaving this out and see. By the way - this start gate has the ability to be triggered by a computer program such as GPRM through the serial port. If you want just a simple pushbutton start switch you can simplify and use the circuit below. If you want a pushbutton such a this just put the matching jack in place of the pushbutton switch (SW1). If you want to be able to use either put the jack in parallel with SW1 as illustrated. Likely there are other pushbuttons out there, but I haven't really looked. I'm also not sure what this one has for a plug. If you find one let me know. *5 J's* wrote: Hmm - never tried it with out having a ground on pin 5. I assumed the open start gate trigger at pin 4 needed this ground. I need to build another start gate for a new track soon - guess I'll try leaving this out and see. I wasn't saying not to use Pin 5 for ground. 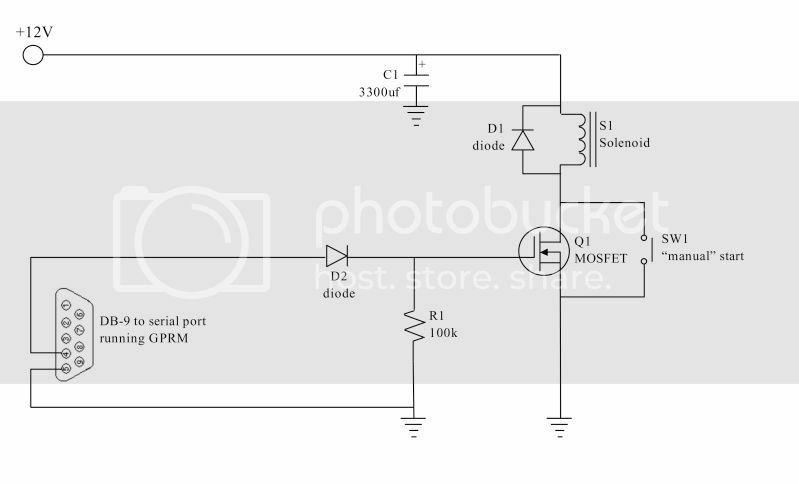 Just only use it on the trigger side of the circuit (before the MOSFET) and then the other grounds on the solenoid side of the MOSFET go to the ground of your power supply. Again, I am not an EE, so I could be off base. They would still be at the same point electrically. *5 J's* wrote: They would still be at the same point electrically. I would hope that to be the case. Though, I do wonder if there should be an optoisolator included in the circuit to protect the computer's serial (or USB) port from any possible damage. A few things to take into account - this is a 12V soleniod, not a 120V - and there is a reversed biased diode in parallel with the soleniod to shunt any field collapse from the soleniod. The R1 resistor also filters any noise. It is a pretty basic and standard circuit with nominal protection built in. Could you engineer more into the circuit - certainly. 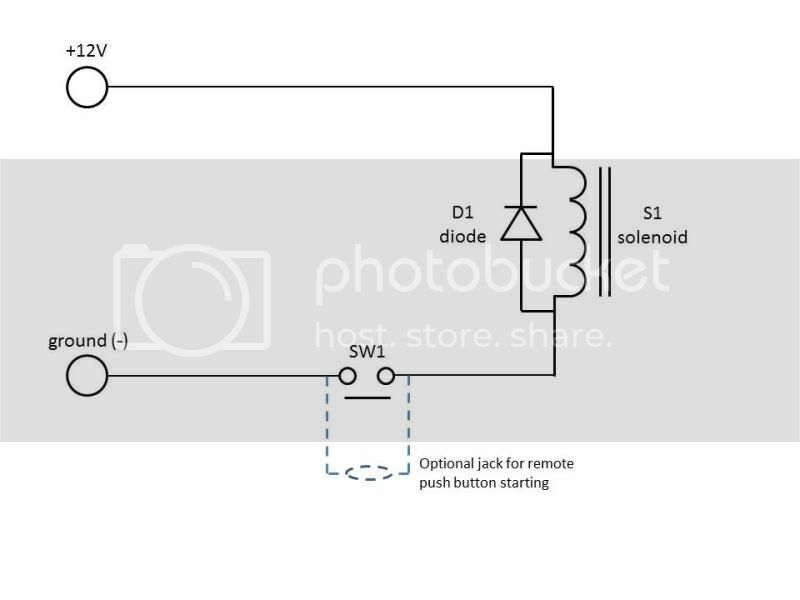 *5 J's* wrote: A few things to take into account - this is a 12V soleniod, not a 120V - and there is a reversed biased diode in parallel with the soleniod to shunt any field collapse from the soleniod. The R1 resistor also filters any noise. It is a pretty basic and standard circuit with nominal protection built in. Could you engineer more into the circuit - certainly. I realize it is not 120V, but I have seen people use 24V and even higher voltage solenoids. I did forget about the diode providing some protection. Speaking about the solenoid and the associated diode, is there an easy way to determine which way to connect the solenoid to the circuit, or is it trial-and-error? I can see which way the diode gets installed, but I need to determine the lug on the solenoid to which 12VDC is applied. If it's not marked - trial and error. If you are using spade terminals - just swap as necessary. TimInOhio wrote: Speaking about the solenoid and the associated diode, is there an easy way to determine which way to connect the solenoid to the circuit, or is it trial-and-error? I can see which way the diode gets installed, but I need to determine the lug on the solenoid to which 12VDC is applied. I kind of figured as much. And yes, since there are lugs, I already have spade terminals installed, and ready for testing. Thanks for the continued help. Let's suppose I want to modify this and include a 2nd switch in series with the 1st switch, so that an over-anxious Scout can't start the race from the 2nd switch, unless the 1st switch is depressed by a leader. And, let's suppose that I want to include an LED in/on the 2nd switch that will light up when the 1st switch is depressed, signalling that the system is "armed." Any input as to how I can incorporate the LED into the circuitry before the 2nd switch?